Free Shipping Included! Slackline Industries Steeze Line - Webbing Only by Slackline Industries at Wildly World. MPN: SI12500. Hurry! Limited time offer. Offer valid only while supplies last. 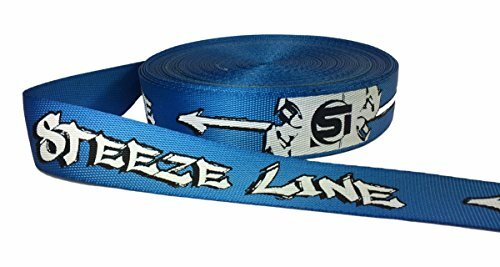 Inspired by Si pro-elite athletes, the squeeze line is a high-performance trickling webbing that pushes the boundaries of amplitude and style. Inspired by Si pro-elite athletes, the squeeze line is a high-performance trickling webbing that pushes the boundaries of amplitude and style. Featuring a trampoline-style weave with rubber grip, this webbing is designed to maximize performance and visibility for high-level tricks. If you have any questions about this product by Slackline Industries, contact us by completing and submitting the form below. If you are looking for a specif part number, please include it with your message.